City Socialite Zari Hassan and fashionista Sylvia Owori are in the news yet again but this time not the usual Zari cat fights but a change of tactics. On Easter Monday, Zari and her now best friend plus queen dancers got onto a boat to have some fun. The boat cruise was organized and taken care of by Zari in terms of costs pertaining to it not leaving out the queen dancers to torture guys with lap dances, Zari's family members and hubby, Sylvia Owori's toyboy Malik Kaliisa all totalling to about 70 were on board. The boat had all tribes of booze and as the ride went on with the booze taking its toll on the partiers, kissing n touching was the order of the boat ride. Ivan and Zari were also seen kissing for the first time in public. However, what perplexed those on board was the Zari-Sylvia kiss. The two kissed passionately with their eyes closed and did not care about a thing. 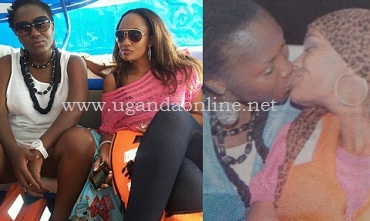 Sylvia has been in the news before when she kissed the Independent's Magazine boss Andrew Mwenda.